Seed Mixes: Generally the bags of mixed seeds from the grocery store are made up of seeds that most birds don't enjoy and generally kick out of the feeder. It's much better to buy bags of seeds of only one kind. Then if you want you can make up your own mix. However, Costco offers a mix that is inexpensive and doesn't have inedible fillers. The ingredients in the Costco mix are, in order: White millet, whole black-oil sunflower seeds, sunflower hearts, peanut pieces and red millet. Black-oil sunflower seeds are received well by many birds in our area. If you only provide one type of seed, make it black-oil sunflower seed. You can buy them unshelled, or, to eliminate the mess, you can get the more expensive sunflower pieces. As of November 2010 Big R has a 50# bag for $17. Thistle (Nyger seed) is enjoyed by finches, especially the American Goldfinch and Pine Siskins, but also House Finches and Cassin's Finches. Suet mixes are available in various locations. Check the label for fillers. Those filled with seed do not provide the high intensity calories needed by birds on cold winter days. Some butcher shops will have chunks of pure suet. There are “recipes” available on-line if you want to make your own mixes. Avoid ones that have “sweeteners” of any kind. Food - Older literature indicates that hummingbirds primarily feed on flowers and your feeders for the sugar water (nectar). However, more recent observational studies strongly suggest they also feed on small soft-bodied insects in much the same manner as flycatchers do. We believe that perhaps one-half of their diet is made up of small arthropods such as fruit flies, gnats, mosquitoes, aphids, spiders, caterpillars and insect eggs. Hummers are capable of living for extended periods without nectar as a component of their diet. They can quickly convert fat reserves and recently ingested arthropods to energy when deprived of nectar. Foraging is done by "hawking" from an exposed perch, gleaning bark and leaves and robbing sapsucker wells. The ratio for your feeder is one part sugar to four parts water. Please NO food coloring. It is not necessary to buy ready-made nectar because the birds get all the vitamins, minerals and proteins they need from the natural nectar and insects they eat. If the hummers are not emptying your feeders, just partially fill them. Definitely, NO honey or artificial sweeteners in the feeders, this may be harmful to the birds. Cleaning - Flush the feeders every week with hot tap water and clean with a bottle brush, rinse. Do not use soap. At least once a month, clean the feeders thoroughly with a solution of 1/4 cup bleach to 1 gallon water, let it set in this solution for about an hour then if necessary clean with a bottle brush. Almost all feeders can be dismantled for easier cleaning. Rinse well with running water and let the feeders air-dry completely before refilling. This can be done at night and refilled the next morning so you don't disrupt the feeding of the birds. When the temperature is over 80°F, change your feeder solution every 3 to 4 days, flushing the feeders with hot tap water and a bottle brush. We recommend clear glass or plastic feeders so you can keep track of the amount of sugar water and its condition. Dealing with Ants: Dip a pipe cleaner in vegetable oil and wrap it around the wire from which the feeder hangs. Ants will not cross the oil. Re-oil occasionally. Peanut Butter Log: Mix peanut butter with cornmeal into a stiff mixture, or use just pure peanut butter. Press some PB into holes that have been drilled into an old log. 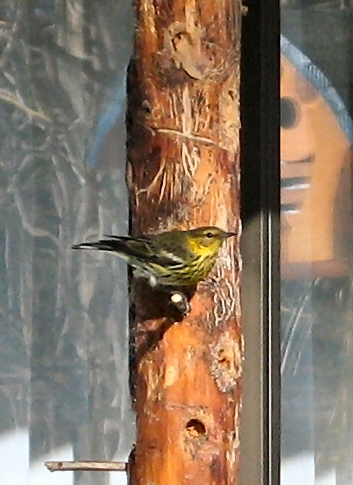 This rare Cape May Warbler was in the Spokane Valley in February 2005 eating peanut butter from the holes in this log. Feeders: Tube feeders designed for specific seeds work well to limit food to desired species. Usually for thistle with very small openings, or sunflower seed. Platform feeders tend to attract less desirable species such as Starlings and House Sparrows. Choose feeders that can be easily cleaned. Water: If you want to attract birds to your yard, water is essential. Often birds that don't frequent feeders will come to the water. The water should be no more than 2 inches deep in the container or you need to provide rocks for the birds to perch on. Dripping water makes the water source more noticeable to birds; misting devices are popular in hot weather. In the summer, change the water at least every other day. To provide water in winter, invest in a heating mechanism or bird bath with a built-in element. Cleaning: It is recommended that feeders and bird baths be cleaned at least once a month. Soak the feeder in a solution of 1 part bleach to 9 parts water. If needed, scrub soiled areas. Rinse thoroughly. Location: Locate feeders and water near tall shrubs or trees that can provide protection from aerial predators. But, avoid locating your feeders near places that provide cover for predators such as cats. If possible feeders should be more than 30 feet from windows. Otherwise when birds are flushed, they are likely to strike the windows, causing injury or death. If providing food for Quail or other ground birds, put it in a different location than the hanging feeders so the food is not contaminated with the feces of the other birds. Try to distribute feeders over a broader area to limit the spread of disease.